The Imagination Station, Vail's learning and discovery center, offers children ages two through 12 a wide array of hands-on science and art activities such as a light table where children can play with shadows and shapes, toddler play area and "science of sound" exhibits. Cost is $5 per child over the age of 2. Parents and and children under age 2 are free. 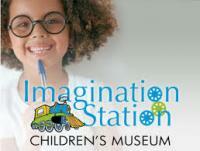 The Imagination Station is located in the Vail Rec District's Community Room in the Lionshead parking structure. Free 90-minute parking is available during the winter and unlimited free parking all summer long.